Above is a digitized image of the original. Below is a transcription. Circa 1959. CHICAGO: Angel Casey, talented performer, gracious, and charming woman is one of the best known free-lance actresses in Chicago. 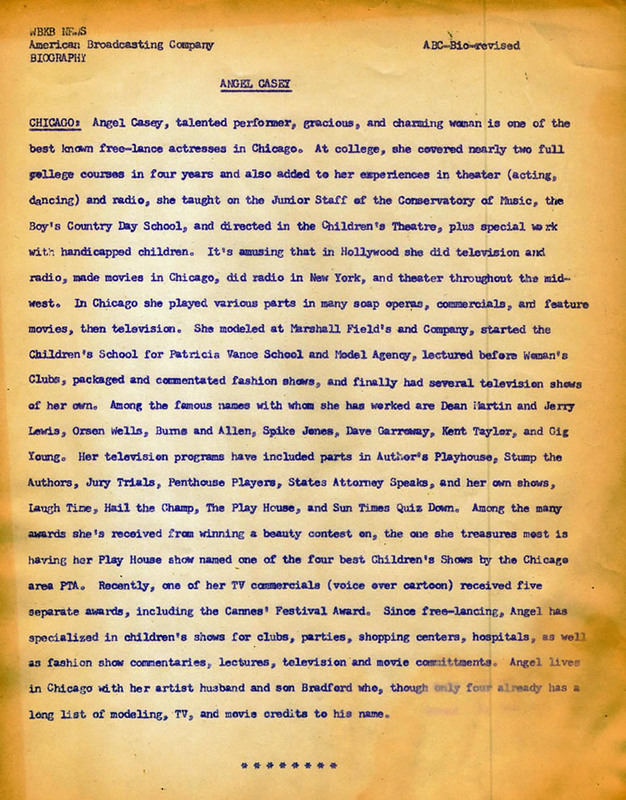 At college, she covered nearly two full college courses in four years and also added to her experiences in theater (acting, dancing) and radio, she taught on the Junior Staff of the Conservatory of Music, the Boys' Country Day School, and directed in the Children's Theatre, plus special work with handicapped children. It's amusing that in Hollywood she did television and radio, made movies in Chicago, did radio in New York, and theater throughout the midwest. In Chicago she played various parts in many soap operas, commercials, and feature movies, then television. She modeled at Marshall Field's and Company, started the Children's School for Patricia Vance School and Model Agency, lectured before Woman's Clubs, packaged and commentated fashion shows, and finally had and finally had several television shows of her own. Among the famous names with whom she has worked are Dean Martin and Jerry Lewis, Orson Wells, Burns and Allen, Spike Jones, Dave Garroway, Kent Taylor, and Gig Young. Her television programs have included parts in Author's Playhouse, Stump the Authors, Jury Trials, Penthouse Players, States Attorney Speaks, and her own shows, Laugh Time, Hail the Champ, The Play House, and Sun Times Quiz Down. Since free-lancing, Angel has specialized in children's shows for clubs, parties, shopping centers, hospitals, as well as fashion show commentaries, lectures, television and movie committments. Angel lives in Chicago with her artist husband and son Bradford who, though only four already has a long list of modeling, TV, and movie credits to his name.